For a long time the centre of Wicklow has been difficult to access due to a lack of any public transport. When Mick Dunbar noticed a gradual increase in business from walkers who wanted to travel between Glendalough and Glenmalure to the train station in Rathdrum, he decided to set up a service dedicated to walkers. This bus service is mainly aimed at walkers on the Wicklow Way who wish to complete a shortened version of the walk, starting or ending in either Glendalough, Glenmalure or Tinahely. However, the service is also of great benefit to hikers coming from Dublin who want to walk for just one day and return home in the evening. Two separate buses meet trains arriving at Rathdrum Station from Dublin. The first bus connects to Laragh, Glendalough and Glenmalure before returning to the train station. The second bus goes to Tinahely via the Iron Bridge (near Aughavannagh) and returns to Rathdrum. These buses will only run provided there is a need for them. They must be pre-booked beforehand. Mon-Sat: Drop off at 11:25. Pick-up at 18:50. Sun & Bank Hols: Drop off at 12:15. Pick-up at 18:35. Mon-Sat: Drop off at 11:55. Pick-up at 17:40. Sun & Bank Hols: Drop off at 12:50. Pick-up at 18:35. Mon-Sat: Drop off at 11:20. Pick-up at 18:10. Sun & Bank Hols: Drop off at 12:10. Pick-up at 18:05. The Wicklow Way Bus can also offer transfers to and from Dublin Airport. If you are travelling in a group, your transport costs can work out cheaper than taking the train, in addition to being less stressful and substantially quicker. 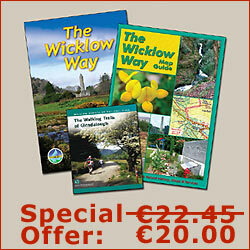 Please enquire direct to Wicklow Way Bus for a quote, giving details of where your accommodation is on the Wicklow Way. Bookings should be made at least 24 hours in advance. Later bookings may be possible but can't be guaranteed. A minimum of 3 passengers (or equivalent fare) is required. Tinahely/Iron Bridge Fare: 13 one-way / 20 return. Glendalough/Glenmalure Fare: 8 one-way / 14 return. 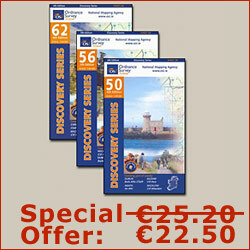 Both Buses: 16 return (for Glenmalure to Iron Bridge walk). Payment is to be made in full upon boarding the bus. Pick-up times are strictly enforced to connect with train times.